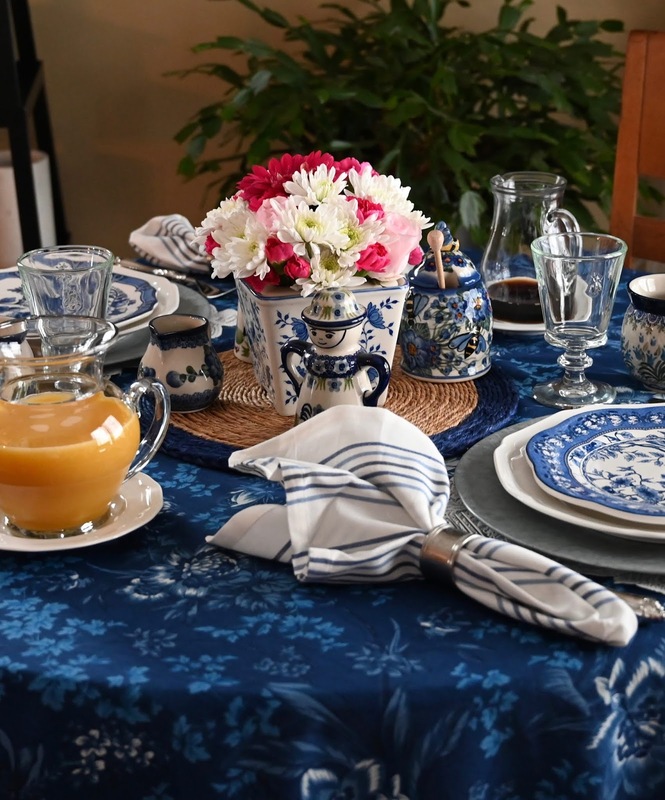 I love the deep saturated blue colors of this April Cornell tablecloth. 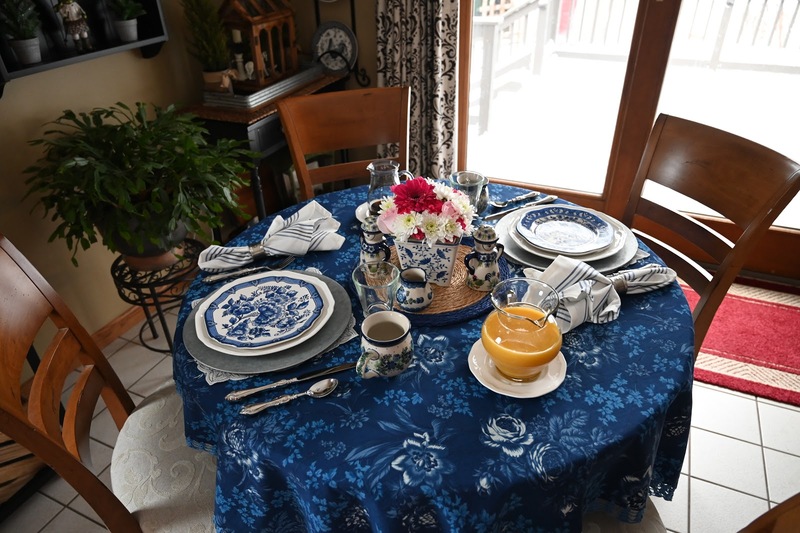 I decided to go heavy on the blues with my dishware as well! 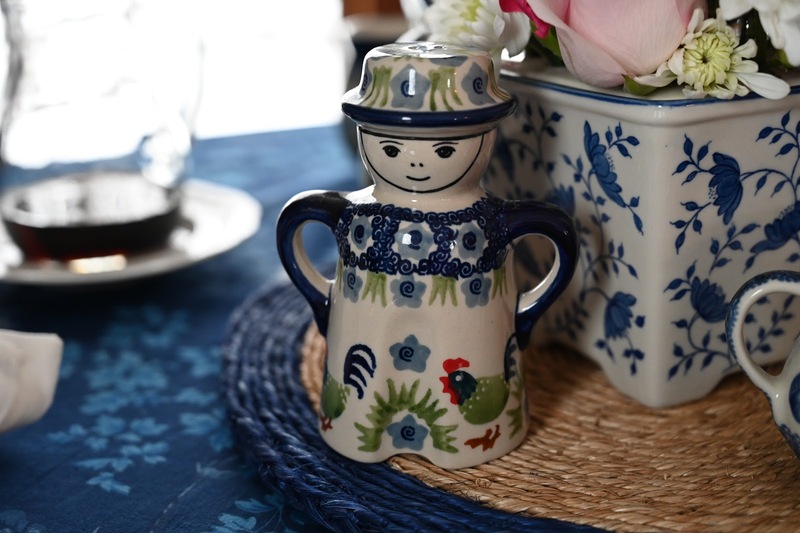 I have a handful of Polish Pottery pieces that I brought to the table. Salt and Pepper shakers and a creamer for our coffee. Last week's tablescape florals are still hanging on but I re-cut them and arranged them in this vase. I used this "blooming flower brick" that I ordered from The Williamsburg Foundation. 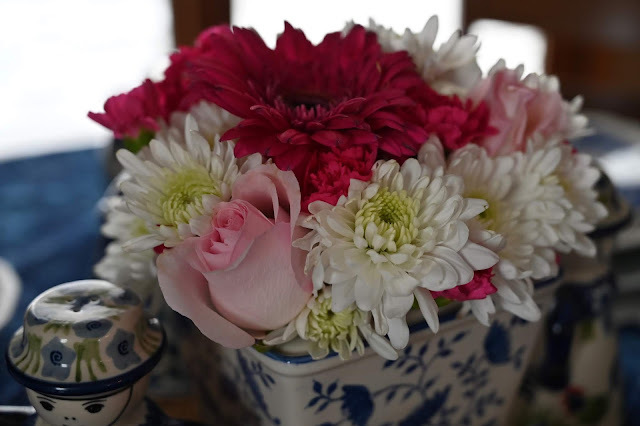 As you can see it has varying sized holes meant to hold larger and smaller flowers and to make arranging easier. The roses had begun to look sad so I peeled away the outer layers that had started to brown to freshen them up. 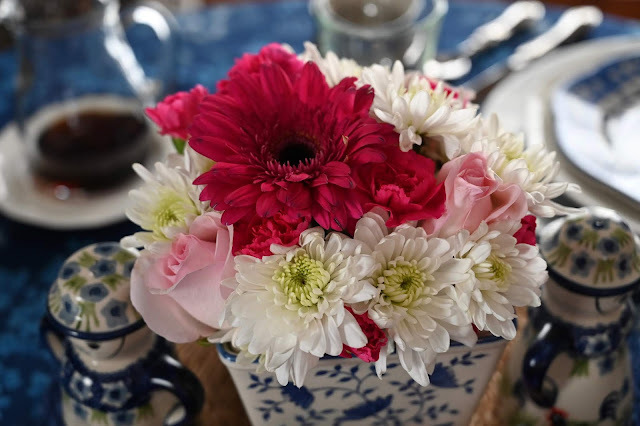 The gerber daisy is pretty much at end of life but the chrysanthemums and carnations are still doing great. I spotted the S & P shakers while in Frankenmuth last year. I think they're really cute and unique. I used a woven mat to cluster the center arrangement pieces. 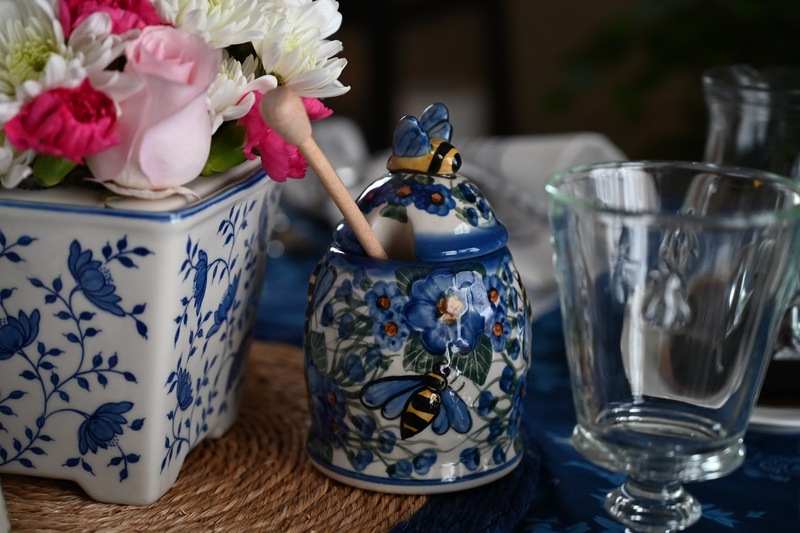 One of my first Polish Pottery pieces was this honey pot. Dan likes to use honey for his coffee instead of refined sugar these days. I chose two of my Polish Pottery coffee mugs with similar colors. The stemware is LaRochere Napoleon Bee. This table is a pot-pourri of products. 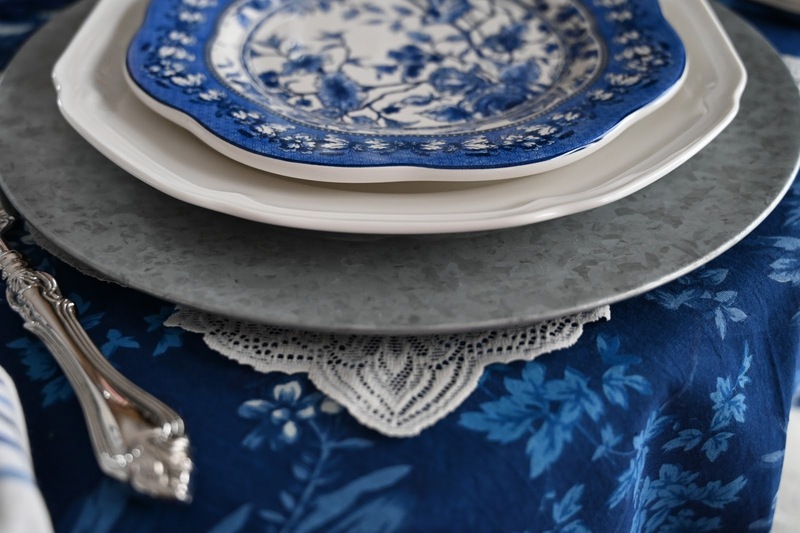 The blue dishes came from Hobby Lobby with the name Certified Internatinal on the bottom which I layered them on my everyday white (French Countryside) Mikasa dishes. 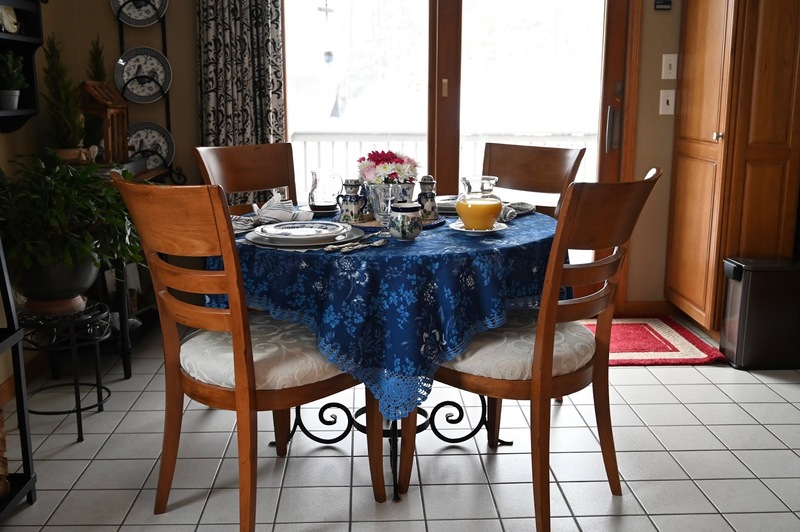 I put a lace doily underneath and chose the galvanized tin charger to keep a casual appearance for the breakfast table. 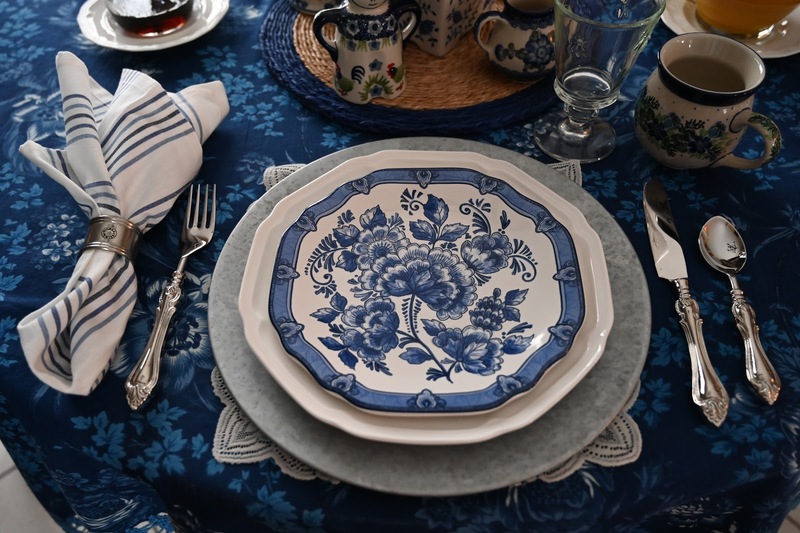 The squared edges of the blue/white plates just happened to pair up well with the white dish design. This is a square tablecloth with this side having a larger crocheted accent. 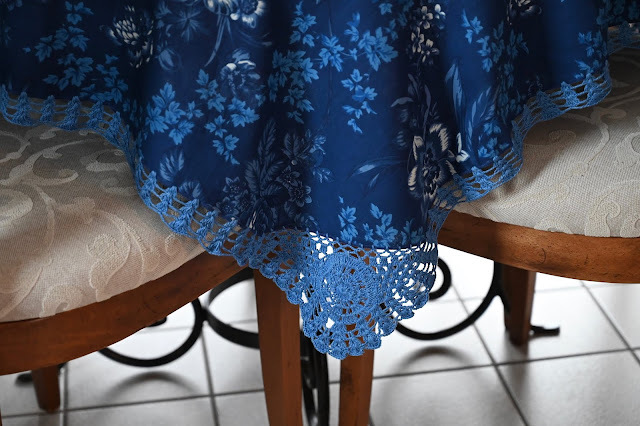 This would be great as a topper on a small accent table with perhaps a white table cover underneath. 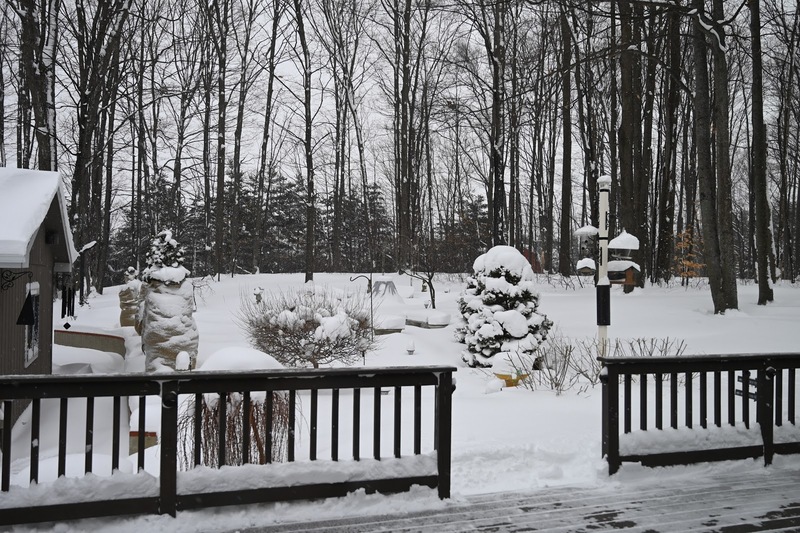 We've been experiencing a great deal of harsh winter weather like a lot of other people have. It was only 7º today. We're used to lots of snow but the extra cold has made the roads more slippery. Staying indoors is the best option since you can get frostbite in a short time. I can only stare at this and dream of spring waiting to see life emerge from the earth again! Love the blooming flower brick Liz. The table scape is so pretty. Stay warm. Thanks Kris- yes that flower brick is a neat piece! Thanks Nancy! It sure is a winter wonderland here! Love that April Cornell. That deep blue is wonderful -- not dark enough to be a navy but dark enough to not be quite so cold as some blue. I love that color anyway. Looks fabulous with your Polish pottery. Is there a good place in TC for that? I'm hoping to add some pieces to my collection of two! It looks wonderful, absolutely beautiful. Yes it’s hard to name the color- almost cobalt blue or ink blue. 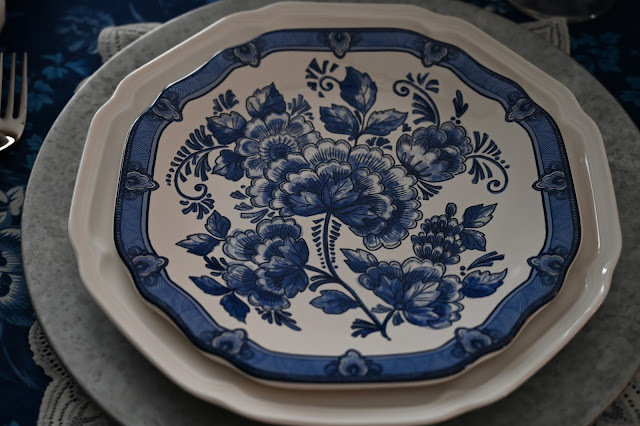 There is a store in Cedar now that carries a lot of the Polish Pottery. Cedar is about 15 miles West and North of TC and the store is called the Polish Art Center. I have found a few pieces here and there in some of the other northern communities. Love those gorgeous blues. And you just know how crazy I am about your honey pot with the best! 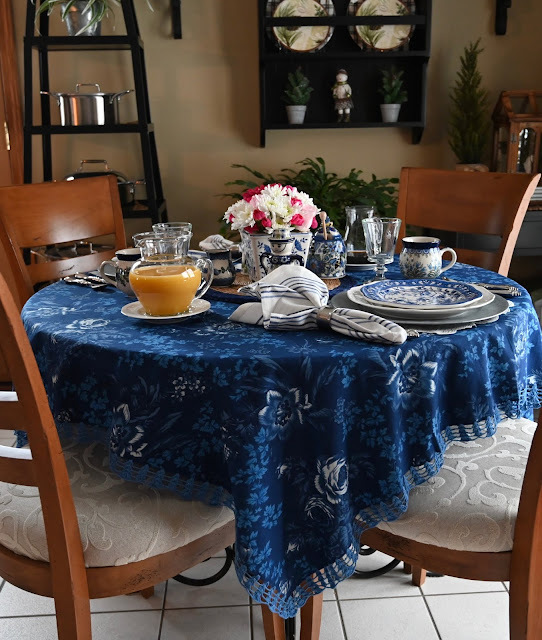 I love your vibrant blue table! 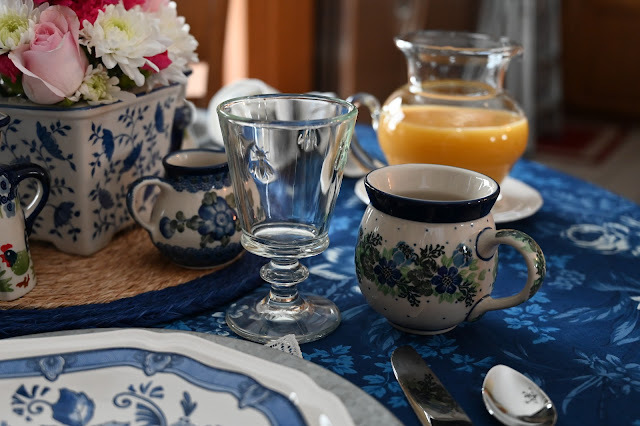 I also love blue and have several kinds of blue dishes. I love to create tablescapes and am thinking about doing a blog. 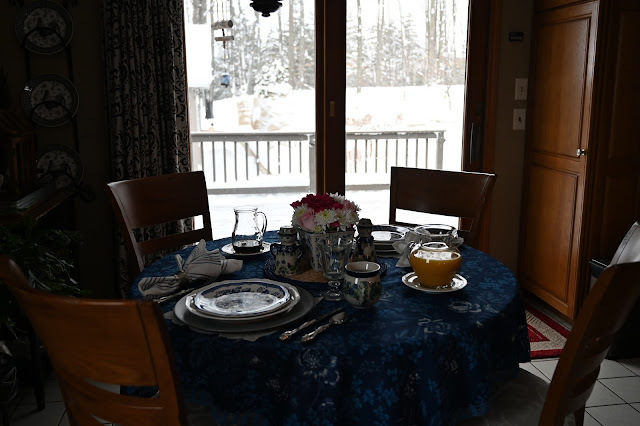 I am new to the Tablescape blogs. Love to see every unique table! What charming pottery pieces and the perfect table design to showcase them. I especially love the flower arranging piece -- and I have the just the blue plates it would go with. Thanks for the inspiration! So pretty, Liz. I had never seen one of those flower holders. Thanks for sharing at Celebrate Your Story! Your table is just lovely! I adore blue and white and really enjoy setting a blue and white table. I wanted to let you know that thanks to your post, I purchased one of these flower bricks from the Williamsburg Foundation. I've wanted one for awhile, and when you provided the link, I ordered one for myself. :D I'm so glad you shared this with us. 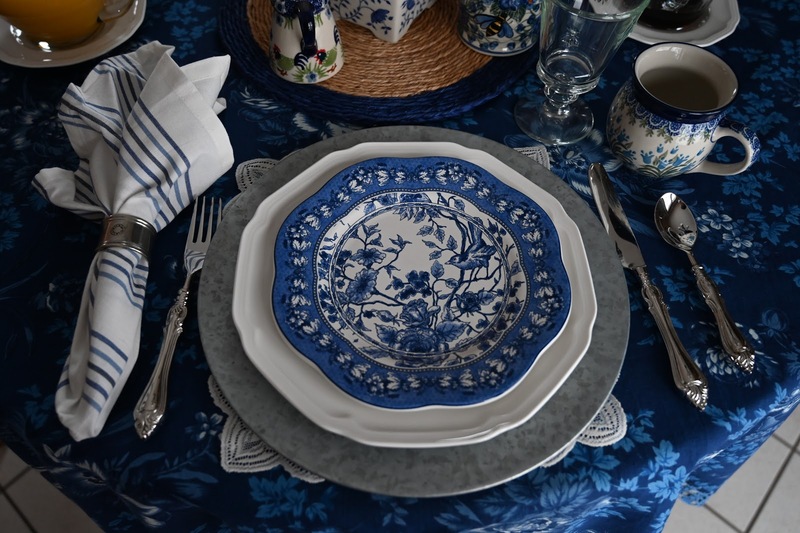 I hope to use mine in a tablescape this spring. 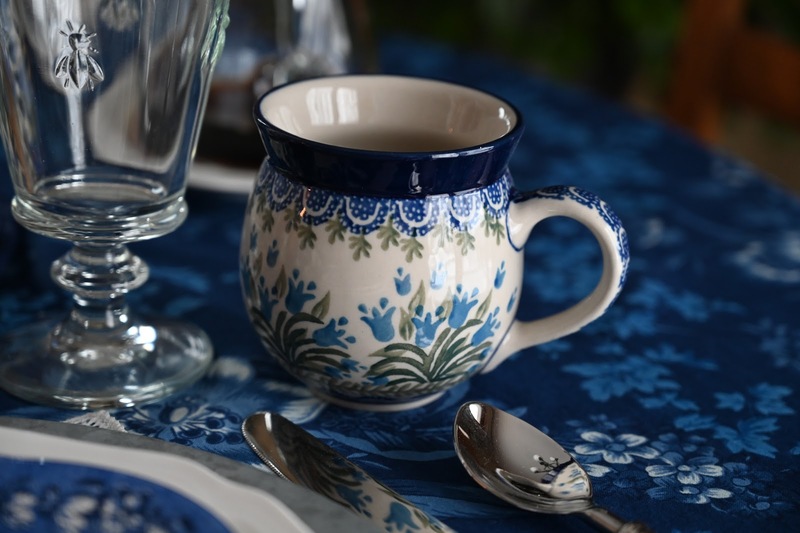 Your Polish pottery is so pretty; I just have two pieces, but they're not nearly as pretty as yours. The honey pot is just darling, and so colorful. 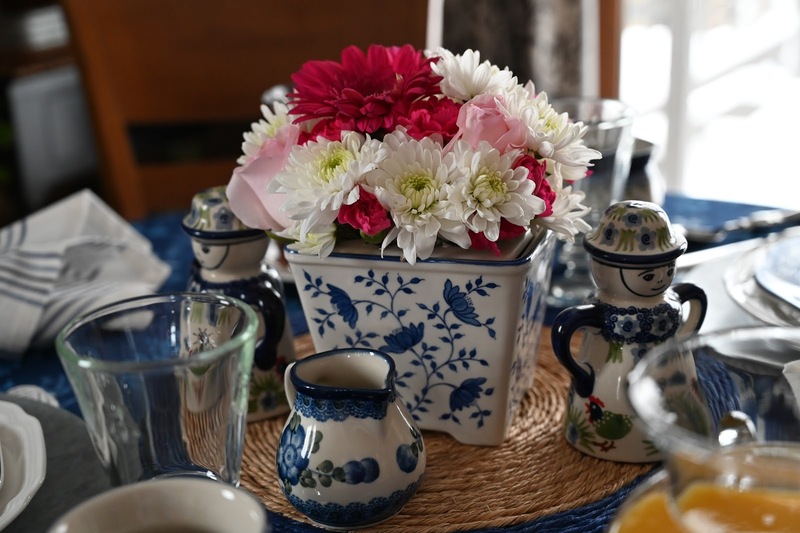 Great blue and white tablescape, Liz! !